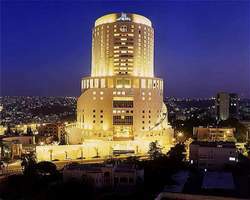 Le Royal Hotel Amman is located on a hilltop in the heart of the capital city. This ultra-modern hospitality complex atop Jebal Amman stands out as the city's loftiest structure, lending importance to all the streets adjoining it. Le Royal hotel offers 282 spacious and comfortable guest rooms that have spectacular vistas and are equipped with superior communication and interactive facilities. Physically challenged guests can opt for the specially adapted rooms available for their convenience. The onsite restaurant serves a wide range of traditional Italian, Japanese and other international delicacies for you to feast on. You can also relax at the cafe with delicious sandwiches, snacks, juices, and drinks or unwind at the bar with your favourite drink.